(Nanowerk News) The star is the coolest and smallest to give off a rare white-light superflare, and by some definitions could be too small be considered a star. The discovery is published in the Monthly Notices of the Royal Astronomical Society: Letters ("Detection of a giant white-light flare on an L2.5 dwarf with the Next Generation Transit Survey") and sheds light on the question of how small a star can be and still display flaring activity in its atmosphere. Flares are thought to be driven by a sudden release of magnetic energy generated in the star’s interior. This causes charged particles to heat plasma on the stellar surface, releasing vast amounts of optical, UV and X-ray radiation. Lead author James Jackman, a PhD student in the University of Warwick’s Department of Physics, said: “The activity of low mass stars decreases as you go to lower and lower masses and we expect the chromosphere (a region of the star which support flares) to get cooler or weaker. The fact that we’ve observed this incredibly low mass star, where the chromosphere should be almost at its weakest, but we have a white-light flare occurring shows that strong magnetic activity can still persist down to this level. Using the Next Generation Transit Survey (NGTS) facility at the European Southern Observatory’s Paranal Observatory, with additional data from the Two Micron All Sky Survey (2MASS) and Wide-field Infrared Survey Explorer (WISE), they observed the brightness of the star over 146 nights. The flare occurred on the night of 13 August 2017 and gave off energy equivalent to 80 billion megatonnes of TNT, ten times as much energy as the Carrington event in 1859, the highest energy event observed on our sun. Solar flares occur on our Sun on a regular basis, but if the Sun were to superflare like this star the Earth’s communications and energy systems could be at serious risk of failing. James’s PhD supervisor Professor Peter Wheatley said: “Our twelve NGTS telescopes are normally used to search for planets around bright stars, so it is exciting to find that we can also use them to find giant explosions on tiny, faint stars. It is particularly pleasing that detecting these flares may help us to understand the origin of life on planets." James adds: “Hotter stars will emit more in the optical spectrum, especially towards the UV. Because this star is cooler, around 2000 kelvin, and most of its light is towards the infra-red, when it flares you get a burst of UV radiation that you wouldn’t normally see. Professor Wheatley adds: “It is amazing that such a puny star can produce such a powerful explosion. This discovery is going to force us to think again about how small stars can store energy in magnetic fields. 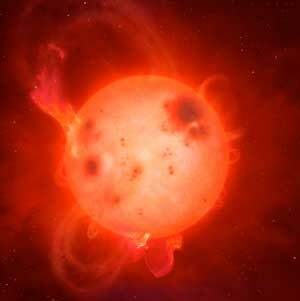 We are now searching giant flares from other tiny stars and push the limits on our understanding of stellar activity”.